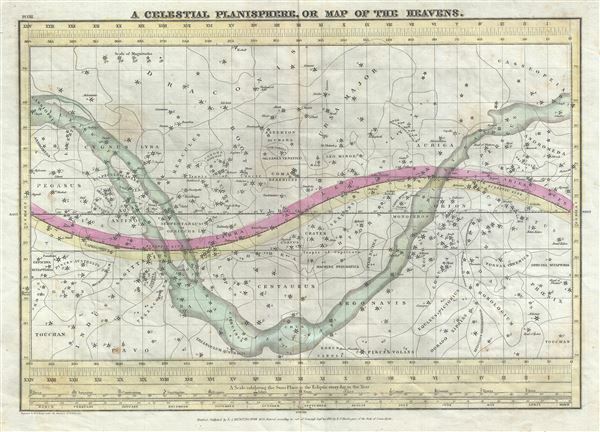 This is a rare and beautifully hand colored map of the night sky by Elijah Burritt. Centered on the ecliptic Line, this map identifying the various zones associated with each major constellation. The Milky Way is shaded in. A scale exhibiting the sun's place in the ecliptic at various times of the year appears at the base of the map. This map, like all of Burritt's charts, is based on the celestial cartographic work of Pardies and Doppelmayr. The map was engraved by W. G. Evans under the direction of E. H. Burritt and issued as plate no. VIII in the New Edition of F. J. Huntington's Atlas, Designed To Illustrate The Geography of The Heavens. Very good. Some spotting and overall age toning. Minor wear along original centerfold. Verso repair near bottom margin along centerfold. Rumsey 2853.005. Kanas, N., Star Maps, p. 277-78. Kidwell, Peggy Aldrich, Elijah Burritt and the 'Geography of the Heavens. ', Sky & Telescope 69 (Jan 1985).